A never-before-seen image of an astronomical alignment of a Uranian moon, Ariel, as it traverses the face of the giant gas planet. It isn't very often that we get an easy chance at spotting one of the outer members of the solar system more than a billion miles out from the sun, but during the latter half of this year into early 2011 the planet Jupiter will engage the distant planet Uranus in series of three cosmic meet-ups. The planet Uranus is right at the edge of visibility for the unaided human eye. Under perfectly dark skies in rural locations, it can be spotted by people with sharp eyes who know where to look. But few have actually ever seen it without binoculars or a telescope. This week the first of the three pairings, called conjunctions, will take place and anyone with access to a clear sky and good binoculars should have no problem in getting a glimpse of Uranus, using its close proximity to Jupiter to guide you. Look for Uranus, along with Jupiter, in the eastern sky after 2 a.m. local daylight time. By late July, it's crossing the meridian at the break of dawn. Opposition comes in late September; thereafter it's conveniently placed in the evening sky for the rest of the year.?? Between the years 1801 and 2050 Jupiter and Uranus are in conjunction 30 times, but there have been only six triple conjunctions during this same time span. A triple conjunction is only possible when the two planets arrive at opposition at about the same time. Around this time Jupiter will appear to pass Uranus, then will appear to temporarily describe a path that causes it to loop on a backward course past Uranus for a second time.? That backward course (called "retrograde motion") soon comes to end and Jupiter resumes its normal eastward path, passing Uranus a third and final time in the process. The last triple series was in 1983 and the next will come during 2037-38. Uranus — faintly visible to the human eye on dark, clear nights — appears only about 1/2000 as bright as dazzling Jupiter. The first conjunction takes place on June 6; Jupiter passing 0.5 degrees (roughly the apparent width of the moon) south of Uranus. Using binoculars that night, look just above Jupiter for a much dimmer "star" shining with a greenish-blue tint. That will be Uranus. The middle of the series will come within hours of when both planets arrive at their respective oppositions. Jupiter gets there first on Sept. 21 at 11:36 UT (7:36 a.m. Eastern Time), followed less than six hours later by Uranus at 16:58 UT (12:58 p.m. Eastern Time). Conjunction is on Sept. 22; Jupiter passing 0.9 degrees (almost twice the moon's width) south of Uranus.? The final conjunction will come in 2011, on Jan. 2, when Jupiter sweeps 0.6 degrees to the south of Uranus. They then part company for just over 13 years until their next summit meeting in April of 2024.?? Uranus is spending 2010 in the constellation Pisces. Saturn was the outermost planet known throughout history, until 1781 when Uranus was discovered by William Herschel. On the night of March 13, 1781, Herschel was observing the stars in the constellation Gemini with a new 7-inch reflecting telescope he had just built when he noticed a blue-green object which seemed too large to be a star. ?Night after night thereafter he pointed his telescope toward this object and soon discovered that it was moving among the stars. Herschel decided at first that he had discovered a comet and wrote up a detailed report of his observations. The report of a new comet excited astronomers all across Europe, and they eagerly trained their telescopes on Herschel's discovery. But the more they studied it, the more they began to wonder if it really was a comet. For one thing, it seemed to be following a nearly circular orbit beyond Saturn. Finally it became clear that Herschel had discovered not a comet but a planet. Uranus is a planet that creeps along a vast orbit, 19 times our distance from the Sun, moving along at 6.8 kilometers a second and advancing eastward at only about 4 degrees per year. The orbital period of Uranus is 84.3 years. Thus, in the 229 years that it has been known, Uranus has moved just 2.72 times around the sky. It arrived at the most distant part of its orbit (aphelion) on Feb. 27 of last year. Uranus is a giant ball of gas and liquid. Its diameter at the equator is 31,763 miles (51,118 km) which is over four times that of Earth. The surface of Uranus consists of blue-green clouds made up of tiny crystals of methane. 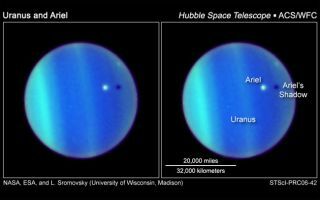 The atmosphere of Uranus is composed of about 83 percent hydrogen, 15 percent helium, 2 percent methane, and tiny amounts of ethane and other gases. In a telescope the bluish-green disk of this giant planet is rather tiny, appearing only 3.6 arc seconds across, or about 1/12 the apparent size of Jupiter.? But Uranus's magnitude of +5.7 means that its star-like image is findable by a keen naked eye on a dark night. On this astronomers scale, larger numbers mean dimmer objects, and +5.7 is near the limit of what can be seen. Those who sight this little spot in their telescope might recall the beautiful images taken by Voyager 2 back in January 1986. Originally Herschel wanted to name his planet in honor of his patron, King George III of England (Georgium Sidus: "George's Star," or the "Georgian Planet"). But ultimately it was named Uranus to match the mythological names of the rest. One reason given was that just as Saturn was the father of Jupiter, the new planet should be named after the father of Saturn. Mercury, Venus, Earth, Mars, Jupiter, Saturn and . . . George?